Sharing an image by an unknown artist, taken from the book ‘Encyclopedia of Clothing and Fashion’ (Scribner Library of Daily Life). 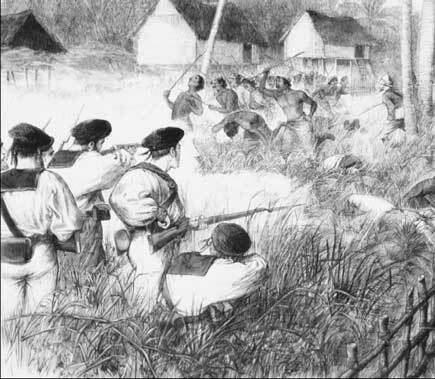 The image is captioned, British soldiers in naval uniforms attack Malay villagers. Indigenous peoples were often considered inferior by colonizers, in part because of their different dress practices, causing dress to become a status-defining mechanism. No matter how you think other wise, fashion has always been political. What you accept as ‘dress’ or appreciate as ‘fashionable’ not only defines your tastes and choices, bur also underscores your political line of inclusion and exclusion. Most importantly, what is native and barbaric must remain excluded from the domain of civilization is also defined by dress codes. British soldiers in naval uniforms attack Malay villagers. Indigenous peoples were often considered inferior by colonizers, in part because of their different dress practices, causing dress to become a status-defining mechanism. Interestingly often our moral position is ambivalent; a large section of politically conscious people see ‘fashion’ as an expression of exuberance and consumerism. Fashion, like any semiotic system, is seized upon by human beings to make statements. They are often explicitly political, on other times subtle. True, in Bangladesh they express consumerists dejuice culture and to depoliticize the society. Nevertheless, we cant blame it to others, we must take responsibility as well, because we have ignored the powerful language of fashion to articulate our relation to traditions, cultures and aspirations of our people. Hardly we study fashion as political history, or realize the articulation of power relations through dress and dress codes. What we wear and how we articulate ourselves signifies a lot what we could become in the globalised world. PRABARTANA is a space to uncover what often remains hidden from our world view.